Here’s a new idea. A couple of young entrepreneurs have found a way to convert sign language into audible speech with their prize-winning electronic gloves. National Public Radio has the story. “For years, inventors have been trying to convert some sign language words and letters into text and speech. Now a pair of University of Washington undergraduates have created gloves called SignAloud. Sensors attached to the gloves measure hand position and movement, and data is sent to a computer via Bluetooth and is then converted into spoken word and text. “Theirs is one of seven inventions recently awarded a Lemelson-MIT Student Prize, with awards ranging from $10,000 to $15,000. “Inventors Navid Azodi and Thomas Pryor, both college sophomores, say the gloves will help create a communication bridge between deaf and hearing communities. The gloves, they say, will help deaf people better communicate with the rest of the world without changing the way they already interact with each other. “Azodi says he and Pryor are moving beyond their prototype and are working closer with those who use American Sign Language to develop new versions. They’re also working on better understanding ASL, which is more than just hand movements; it also uses facial expressions and body language to convey meaning.” Read more. I don’t know much about the culture of the deaf community, but I do remember reading about resistance to cochlear implants a few years ago. It’s hard for people who can hear to understand that some people really don’t mind deafness and prefer their own ways of dealing with the world. But kudos to all inventors anyway, especially young ones open to continuous revision! 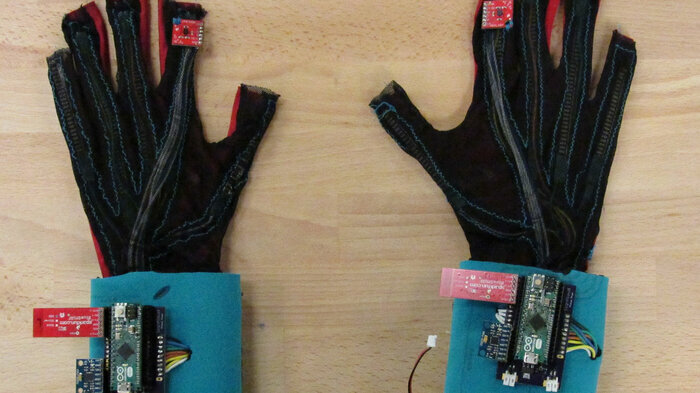 SignAloud gloves translate sign language into text and speech. The best part of this story ends up being the fact that the students are receptive to learning more about the needs and wishes of the deaf community. Their hearts are in the right place! A mantra for all inventors seems to be “Try, Fail, Fail Again.” In other words, Keep Prototyping.